The work of more than 20 talented artists and designers from RGU’s Gray’s School of Art who spent a semester studying abroad is on display at a special ‘Study Abroad and Erasmus+’ exhibition. The students, who were studying a variety of courses including fashion & textiles design, three-dimensional design, communication design, fine art and contemporary art practice, travelled to various locations around Europe and Canada to study in one of Gray’s School of Art partner Schools to refine their practice in a different cultural setting. The Erasmus+ and International study abroad programme allows students from RGU to spend an entire semester studying at a different institution, giving them the opportunity to expand their network of contacts and develop their chosen craft. The Gray’s students then put on an exhibition which will showcase what they have produced from their time abroad. Erasmus+ Coordinator and Gray’s lecturer, Cameron Campbell, commented: “I have been involved with the School’s study abroad programme for over twenty years now and we have been curating these exhibitions for the last 10 of those. 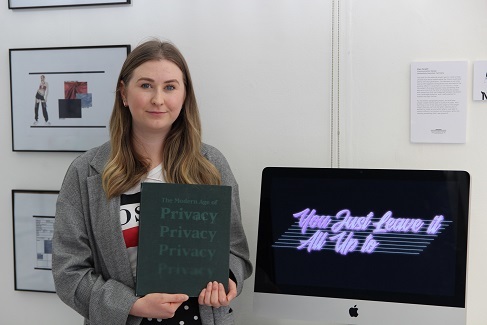 Ellen Forsyth, an Honours year communication design student, travelled to Hannover, Germany, where she integrated herself within the visual communication class at the University of Hannover. “Going on Erasmus+ allowed me to explore what it was I wanted to do as a designer and to find out who I was, rather than always worrying about what other people thought. “It’s not only helped me within my work as a designer but it helps socially as I have come back a more confident person. Eleanor Macdonald, who is studying fashion and textiles, was located in the home of fashion, Milan, at the Politecnico di Milano. “The university was very different from Gray’s as it was very technical and industry focused so it was a really good experience to go to there and learn something new. “Milan is obviously one of the main fashion hubs in the world so just being in the city was incredible. Men’s and Women’s Fashion Week was happening while I was there so I got to be amongst all that. The ‘After Show’ Study Abroad Exhibition runs until Friday 12 October at Gray’s School of Art, Garthdee Campus.